1. Introduce yourself and tell us a little bit about your practice? I've had an interest in creating art since my mid 20s - even though my day job was running a computer training company. I went on short courses in Painting, Ceramics and Print Making whenever I could afford to and I would make things whenever I could. As I moved on and changed careers then I found that Art was constantly getting pushed to the back of the queue. I managed to do a few courses in glass making and discovered that I loved the excitement and unpredictability of it. However, I still had very little time to devote to it and glass is not something you can do in your spare room, so I decided to bite the bullet and do a degree in glass. I had been running my own psychotherapy practice for about 10 years and kept telling other people to find a way to follow their dreams and eventually took my own advice and started a glass degree with the University of the Creative Arts in Farnham, Surrey in 2014. I graduated last year and have been making glass art ever since, setting myself exhibition targets so I had milestones to aim at. My first solo exhibition was in the Old Fire Station Gallery in Henley in September 2017 and I will be returning there on August 15th this year. I predominantly make cast glass pieces in the kiln and these can be in the kiln for up to 5 or 6 days depending on how big they are. I’ve also starting painting again and am really enjoying the contrast of processes between the glass and the painting. 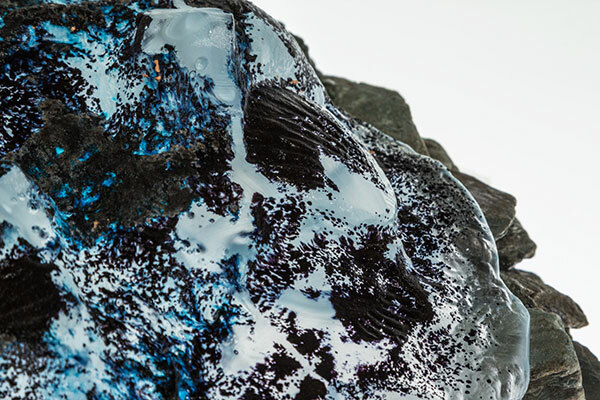 I am currently working on a series of glass sculptures made from Ice. I freeze ice blocks and then shape them using a blowtorch and salt until I get what I want. I then create a plaster mould from the ice sculpture that I can put in the kiln with glass. 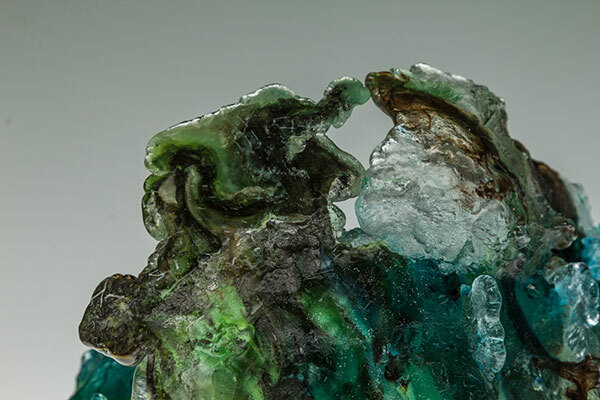 I love the textures and the organic look and feel of the glass using this method. Part of the enjoyment is taking something that will simply disappear back into water if left and making it solid but still maintaining a feel of the original piece. These are all unique one-off pieces and cannot be reproduced. 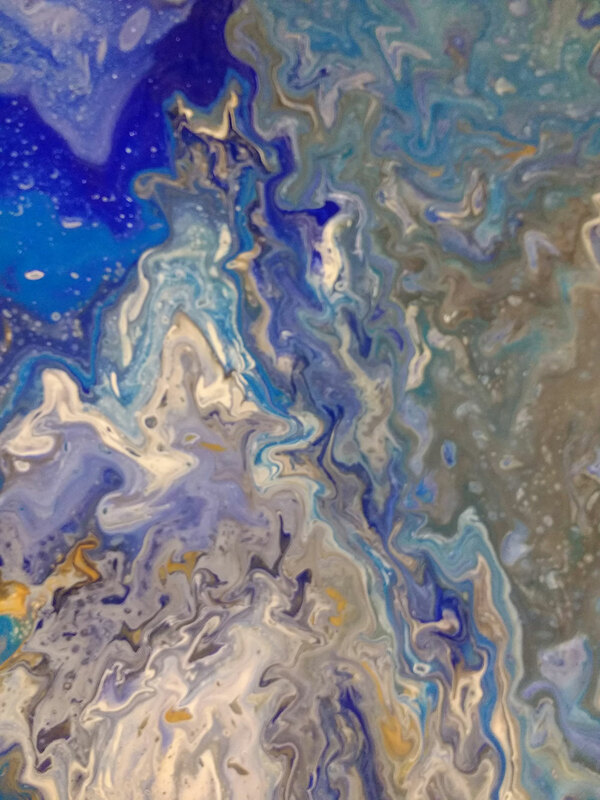 I’m also doing some abstract painting - pouring acrylic paint onto the canvas and manipulating it – I love the flow and movement produced with this method and the fact that each piece is unique, just like the glass pieces. 3. Do you have studio space elsewhere? I have just had a wooden studio and metal kiln room built in my garden at home and I’m loving my commute to work – about 10 seconds across the garden – fabulous! It also means I can go and check my kilns at midnight if I need to which is just wonderful. 4. What are your other (work) commitments if any? Most artists need to do some other work to get a regular income in and I’m no different. I run a property management company based from home and probably divide up the week half and half with Art and other work. 5. How does being an associate at Magdalen road support your work? It’s a really important part of my support system as I get to meet other artists working in different media and swap ideas. There are a lot of events that take place at the studios now to support the artists there which allow all of us to share thoughts and help each other. It’s also great to be able to have shared and solo exhibitions in the new gallery space and join in events elsewhere as a group of artists rather than trying to do things all by myself. 6. What are you hoping to achieve over the next year?